Apparently summer ends when August ends (let us hope the weather disagrees) so we return to an 09:30 start for this weekend’s ride out to Market Harborough. 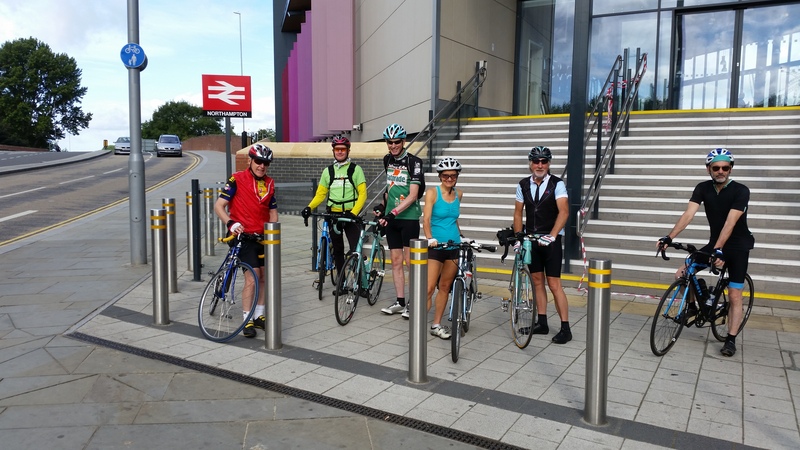 The route is just over 50 miles in total and does feature a couple of hills, although we shouldn’t be climbing as much as on the last two rides, and we have two stops for recovery (Kelmarsh and Waterloo Farm). If you plan on riding skinny tyres, make sure they’ve got plenty of air in them. Some of the tarmac is a little broken and some of the route* is best described as “pavé”. Don’t worry, we won’t be hurrying over this bit and your tyres will be fine so long as they’re properly inflated. MTB tyres will not be required. The planned route is here: https://ridewithgps.com/routes/16229338 although, as ever, the Leader reserves the right to amend it on the day if (s)he sees fit. That’s my excuse and I’m sticking to it. At time of writing, the weather is forecast to be dry with not too much wind and temperatures in the high teens (60s in old temperature). Almost perfect conditions! Hope to see you outside Moulton Co-op, 9.30 am on Sunday. * northern-most section of the Brampton Valley Way, which is cobbles sprinkled with a little light gravel. No big rocks, no mud, no need for fat tyres. 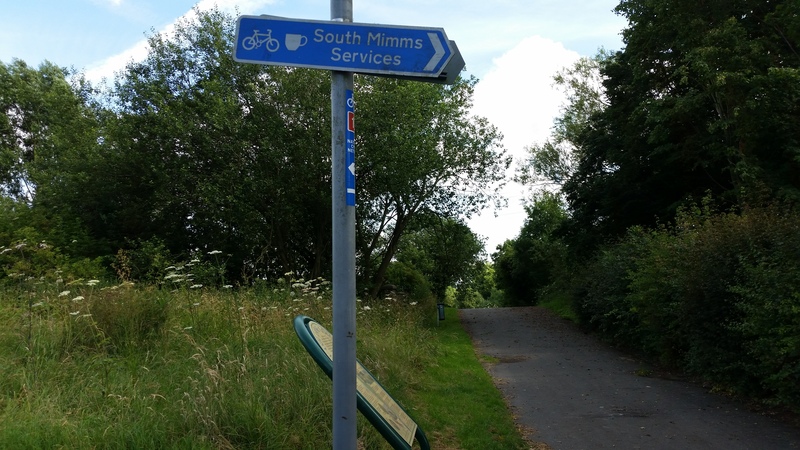 Ten of us met up at East Hunsbury for James’s 40 mile tour through some of the more rural parts of western Northants to coffee at Daventry Country Park. Six opted for the brisk ride led, in the absence of James through injury, by Giles, and four for the moderate paced effort led by Iain. On a showery day, only once were we soaked, on the outward journey, and that was by a short sharp downpour around Preston Capes. As ever it took me until the shower was over and I was drenched to find and put on my waterproof jacket. Are there Di2 versions for the likes of me? 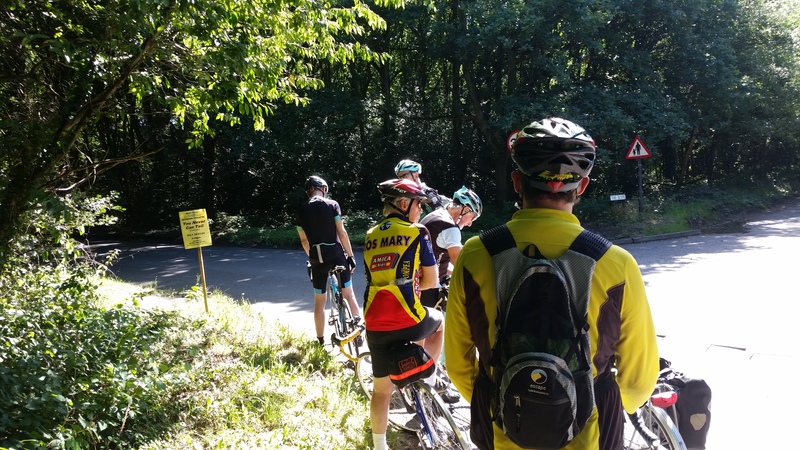 The brisk group kept up a fine spanking pace until Newnham hill when some of us came as close as it gets to a wheezing halt without actually falling off. Thank you Giles and Chris for waiting for us at the top – could you look a little more knackered next time? We were soon safely seated at the country park and after about half an hour joined by the moderate group who had also had a pleasant time until the hill. Can’t it be levelled somehow? 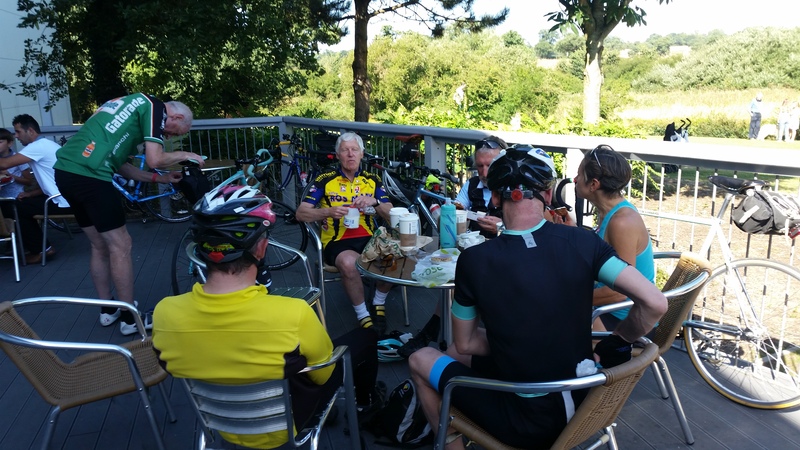 Coffee and cake and bacon and egg butties (7/10 from Giles) and the brisk group were off to battle home on the lovely route through Whilton, Great Brington, Upper Harlestone and down through Upton to the river and home. We were only caught by another shower just as we got to our homes, although I understand the moderate group had a bit of a dousing along the riverside. Good to have Chris out for his third run and to see Hartley for the first time in a while. Iain D sported a new machine which, on passing Leisure Lakes Bikes, was taken in for some minor brake adjustment (as in “I had no brakes!”, which they sorted without quibble or charge despite me not having bought the bike from them! So many thanks to the staff there – Iain). How many people conspire to have a mechanical outside a bike shop? Thank you leaders both – Iain and Giles, and we look forward to Giles getting the promised reading glasses so that he can see his Garmin better, although, as he hasn’t a clue how to work it, I can’t imagine what difference it’ll make! Steady pace ride (average speed 13mph (21kph), speed on the flat 16-18mph). Return to Moulton before 4pm. The route is via Pitsford along a short stretch of the A508 to Brixworth where we move on to quiet roads through Guilsborough, Naseby (cafe / shop in both) and on to Sibbertoft, Laughton Hills and on to Wistow (31miles), the most northerly point where we stop for an early brunch. There are no planned stops before this so please bring water and a snack. The return route heads South via Lubenham to Naseby, Cottesbrooke and back to Moulton. Depending on the group we have a chance to stop for tea on the way back. This is a route originally planned by Milton who will be very disappointed not to be doing the few challenging hills on this route. It is mainly on quiet country lanes through some attractive countryside. 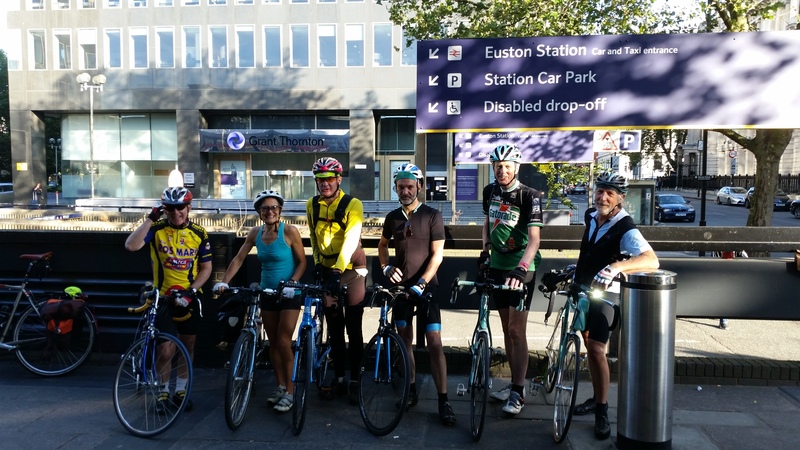 James, one of our Ride Leaders, reports on the CTC Northampton ride *to* London on 7th August 2016, planned and led by Ian Macsporran (group Treasurer and your regular correspondent). places was largely due to guesswork and a well-known online mapping service. going to provide us with something akin to perfect cycling conditions. London is always an adventure – even on a late Sunday afternoon. Note: this report has been edited slightly from the original for legal and other reasons.